"Helping you preserve your assets is important to me. I will evaluate your situation and provide you with a clear and solid plan of action. I can also help expedite your Medicaid application process." Fred Jacob has been a Counsellor at Law for over 40 years with a special focus on Elder Law Asset Protection Planning & Estate Planning. 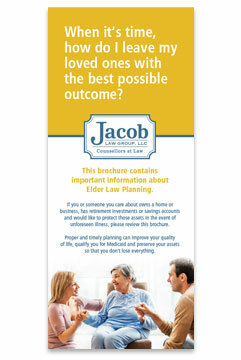  If I am in good health now, should I still do Elder Law Planning?  Yes. Illness can strike anyone at any time. When it does, it can be physically debilitating and financially crippling. If you wait too long to plan, there are much more limited options as to what you can do to shield assets. You need a solid game plan. The best plan is the one formulated while your health is still good.  What happens to my assets if my spouse becomes ill and needs nursing care?  All of your assets would need to be disclosed and most of them spent to pay for your spouse’s care. You may have to spend down to your last $23,184 which includes the $2000 your spouse is allowed to keep. With proper planning, however, you can preserve far more through utilizing asset exemptions to prevent spousal impoverishment.  Can I protect my home?  With adequate planning you can. Without adequate planning, Medicaid can place a lien on your property after six months if you need long term care.  Why won’t Medicare pay for my long term care?  Medicare provides health insurance for hospital services, doctor visits and prescriptions. It will also cover “rehabilitation” -- such as physical, occupational and speech therapy -- for limited periods of time. It will not pay for most aspects of long term care. After rehabilitation stops, the program that will pay for long term care if you qualify is Medicaid.  Medicaid is a program primarily funded by the federal government that provides for the health needs of the indigent. In New Jersey, the Board of Social Services of each county makes the initial determination of eligibility. Medicaid is primarily set up to pay for nursing home care, but also administers waiver programs that will pay for limited home care. To financially qualify, a single individual can have no more than $2,000-$4,000 in liquid assets (depending on which Medicaid program they qualify for). If you have assets in excess of this amount, you will have to pay privately until your resources are exhausted down to those thresholds.  How can Elder Law Planning help me retain more of my assets?  Elder Law Planning involves a thorough and complete evaluation of your income, your assets, your health, and your family network. Our office will provide you with an Estate and Asset Protection Questionnaire in which you will list your income, your resources, life insurance policies, stocks and annuities. These must be carefully scrutinized to see which assets can be captured and which assets are exempt. Trusts, Will, Living Wills, Powers of Attorney and Deeds are reviewed. New ones are often prepared as part of your personal “Asset Protection Plan.” That plan always anticipates the time when a Medicaid application may need to be submitted.  What records will I need for the Medicaid application?  The Medicaid “look back” period is currently 60 months. An accounting will have to be produced to process the application. Bank statements for the 60 months prior to application are required. If you have made transfers of property to others for less than fair market value, a period of ineligibility (penalty period) will be assessed before Medicaid will take over payment of long term care costs.  Can I make gifts?  You cannot make gifts during the 5 year “look back” period. Most Boards of Social Services will not penalize small gifts for Christmas or birthdays if you can prove that was your custom over many years. All other gifts will subject you to a penalty period of ineligibility.  Can I pay my children or a family member to take care of me?  Yes, as long as the charge is reasonable and there is a contract in writing. Without a written agreement, the Board of Social Services will deem every minute that a child spends caring for you as having been done for “love and affection.” Preparation of Caretaker Agreements between Elders and family members is an integral part of Elder Law Asset Protection Planning.  Will my children’s assets need to be used to pay for my care?  No. Although most of your spouse’s assets may need to be spent to pay for your care, your children’s assets are not at risk. The exception to this is when children sign a guarantee to an assisted living facility or nursing home that they will personally pay after their parent’s resources are depleted. A child who signs those agreements for the care of a parent should always do so only as the parent’s representative, i.e. Power of Attorney or Guardian.  Can I engage in Estate Planning at the same time I do Asset Protection Planning?  If the combined assets of you and your spouse are $675,000 or more, you should absolutely engage in Estate Planning. This can be done at the same time that you pursue Asset Protection Planning. The State of New Jersey will tax children andother family members at 14% of everything over $675,000. The upper middle class can save tens of thousands of dollars by forming Trusts to minimize the estate tax bite. The Estate and Asset Protection Questionnaire that you fill out will reveal if you can benefit from Estate Planning as well as Asset Protection Planning.  If Medicaid turns me down, do I have any recourse?  Whenever the Board takes an unreasonable position or assesses an unfair penalty, I request a Fair Hearing. The issue appealed from is then decided at a hearing by an Administrative Law Judge. Fortunately, early planning with an Elder Law Attorney can usually avoid the need for such hearings. For more information on Elder Law or to schedule a consultation, please contact the law firm of Jacob Law Group at (856) 825-0700, or Email Us. For purposes of confidentiality, legal questions cannot be answered over the phone, or by e-mail, unless you are an existing client. If you are unable to come in for an appointment at the firm, we are available to meet with you at your home or at the hospital.